The Roman or “pre-Julian” calendar was created during the founding of Rome and is believed to have been a lunar calendar. The calendar originally consisted of hollow months that were 29 days long or full months that had 30 days. The original Roman calendar was said to be invented by Romulus, the first king of Rome, at around 753 BCE (Before Common Era). The calendar started the year in March (Martius) and consisted of 10 months, with 6 months of 30 days and 4 months of 31 days. The winter season was not assigned to any month, so the calendar year only lasted 304 days with 61 days unaccounted for in the winter. The 304-day Roman calendar didn’t work for long because it didn’t align with the seasons. King Numa Pompilius reformed the calendar around 700 BCE by adding the months of January (Ianuarius) and February (Februarius) to the original 10 months, which increased the year's length to 354 or 355 days. The addition of January and February meant that some of the months' names no longer agreed with their position in the calendar (September - December). The month Quintilis was renamed July in honor of Julius Caesar (who was born in July) in 44 BCE and Sextilis was renamed August in honor of Augustus (who was born in August) in 8 BCE. The Roman calendar was still flawed after adding January and February, as well as the days and months needed to keep the calendar in line with the seasons. Many attempts were made to align the calendar with the seasons but all failed. An extra month (intercalary month) was added to the calendar in some years to make up for the lack of days in a year. When Julius Caesar became pontifex maximus, he reformed the calendar by getting rid of the intercalary months. The Julian Calendar was created, then completed during his successor Augustus' reign. Augustus wanted 31 days in the month named after him because July (the month named after Julius) had 31 days. So that extra day was taken out of February since it was the month in the middle of winter. The Julian calendar introduced the Leap Year every 4 years. 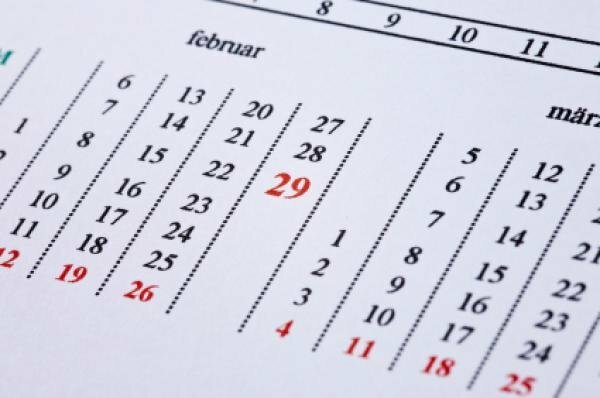 At the time, Leap Day was February 24, because February was the last month of the year. April 1st was celebrated as New Year's Day. he Julian calendar introduced an error of one day every 128 years, which meant that every 128 years the tropical year shifts one day backwards with respect to the calendar. This made the method for calculating the dates for Easter inaccurate. The solution to this error was to replace the Julian calendar with the Gregorian Calendar in 1582 in nearly all countries. The Gregorian calendar reformed the Julian calendar because the Julian calendar introduced an error of 1 day every 128 years. The introduction of the Gregorian calendar allowed for the realignment with the equinox, however a number of days had to be dropped when the change was made. The Julian Calendar moves slightly slower than the Gregorian Calendar, introducing an error of 1 day every 128 years. This means that the difference between the two calendar systems increases slowly over time. The papal bull issued by Pope Gregory XIII in 1582 decreed that 10 days be dropped when switching to the Gregorian Calendar. However, many countries chose to introduce the new calendar in later years. The later the switch occurred, the more days had to be omitted. Currently (years 1901 - 2099), the Julian Calendar is 13 days behind the Gregorian Calendar. New rules were set to determine the date of Easter. New Year's Day was set as 1st January in 1564. People who refused to accept January 1st as new year's and still celebrated 1st April as new year's were called as fools and hence the term "April Fools" was born. The Gregorian Calendar is a solar based calendar based on the 365 day cycle of Earth's revolution around the sun. It was divided into 12 months, each of 30 or 31 days. January and December were made to have 31 days making a total 7 months having 31 days. These extra days were taken out of February since it was considered the last month of the year before 1564. So February had only 28 days. The Earth takes 365.242199, i.e., approximately 365.25 days to revolve around the sun. This caused an extra day every 4 years that needed to be added to the calendar. This day was added to February every leap year thus giving it 29 days every 4 years. superb post @thunderbolt ! In my house we use the Julian calendar because we are lipoveni (russian christian ortodox old rite) that live in Romania. We do this to conserve our heritage, but in the same time we act on Gregorian calendar for the changing of the seasons. Congratulations @thunderbolt! You have received a personal award!